Chile's economy has slowed in recent quarters, as the once booming mining sector has performed poorly and fixed investment has fallen sharply, taking business and consumer confidence with it. These issues continue to plague the economy as we move into Q3, with that in mind FocusEconomics Economist Oliver Reynolds interviewed Senior Economist for the Chamber of Commerce of Santiago, Maria del Pilar Cruz, about the potential future of the all-important mining sector as well as future economic growth prospects, President Bachelet's reforms, and inequality in Chile. María del Pilar Cruz Novoa is a Commercial Engineer at the University of Chile and currently serves as senior economist at the Chamber of Commerce of Santiago (CCS). She has a long history in the field of economic analysis, economic research and economic evaluation and in the evaluation of industries. Co-responsible for the economic analysis proposed in the matter of agendas of public policies for development and the generation of economic opinion guidelines of the CCS. She was awarded in 2016 and in 2017 with FocusEconomics' Top Analyst Forecast Award for the most accurate economic projections for Chile. FE: How do you consider the prospects for Chile’s vital mining sector over the next few years, will it recover any of its former dynamism? MPC: The boom of the copper super cycle in Chile was strongly related to the extraordinary increase in copper prices by a ratio of 1 to 4 in a span of just a few years. The economy made great efforts in terms of allocating much of its productive resources to the sector to take advantage of the exorbitant prices. This resulted in a significant depletion of ore grades, a decline in productivity in the sector, and only moderate increases in production. The development of the mining sector in the coming years will be less concerned with price and more with an orderly expansion of output with improvements made to production and cost alignment. This will undoubtedly require investment in new technology and greater mineral prospecting with a goal of improving productivity. In this sense, the mining sector will continue to be of great economic importance, however, there will be less focus placed on price cycle fluctuations and more toward regaining productivity and competitiveness. FE: What would the country have to do to boost its GDP potential growth rate, and what are the main things the new government, which will be elected at the end of 2017, could do in this regard? MPC: The long-term growth of the Chilean economy is currently sitting between 3.2% and 3.4%, which is significantly lower than the country's growth rate of 5.5% between 1985 and 2012. At present, the economy is growing at a much slower rate and 2017 will likely end with an expansion of around 1.5%. In the immediate future, there are specific areas that require attention, such as improving confidence and reinitiating investment projects that are currently at a standstill. Addressing each one of the aspects above is highly complex because it not only requires an accord between political, economic and social forces, but also the formation of a global development strategy for the next few decades, which would require significant technological, demographic and migratory changes. This is still a topic of debate at the country level, but we believe that this strategic plan of action should go a long way to developing a service-based economy, strongly integrated with international trade. FE: How do you evaluate the effectiveness of Bachelet’s reforms, particularly the reform of the education system to widen access and move towards free higher education, and the tax reform? MPC: It is too soon to evaluate the success or otherwise of Bachelet’s main reforms (tax, labor market and education) a mere two years after most of them were implemented. Nevertheless, the regulatory change which has characterized the government’s time in office has generated more uncertainty for businesses. In any case, all signs suggest that in the coming years the jury will still be out regarding the effects of the reforms currently in the pipeline (chiefly the constitutional reform and pension reform) as well as those already implemented. It may be necessary to simplify the tax reform in order to improve tax collection without raising rates, and the country must shrink the fiscal deficit which has risen as a result of the slowdown in GDP growth and the end of the commodity super cycle; if not, it will run the risk of seeing its top-notch credit ratings downgraded. The need to balance the books made it expedient to pause the move towards free universal education, in order to evaluate the changes made to date. The effectiveness of the labor market reform, which centered on the role of unions, cannot yet be determined, as the new law only came into force in April 2017. FE: Chile is still the country with the highest level of income inequality in the OECD. What more could be done to reduce the level of inequality? MPC: Although by OECD standards Chile is still a highly unequal country, evidence shows that recent years have seen sustained and significant progress in this area. The Gini coefficient has fallen by more than seven points in the last 15 years, and by almost four points in the last 10. Moreover, the generation born in the 1990s has seen a 20-point improvement relative to the generation born three decades earlier. These advances have gone hand in hand with sustained falls in poverty and extreme poverty, with Chile boasting the lowest levels of each measure in Latin America. The country is also the region’s highest-ranked country in the United Nations’ Human Development Index (HDI). Economic, political and social discussions have become increasingly centered on the topic of inequality, although the advances made in recent times are often overlooked. Despite these achievements, Chile still has a long road ahead, and the country faces issues of not only an economic, but also a social, urban and educational nature. Access to education at all levels must be widened further. Although this has been an important factor behind recent falls in inequality, going forward the education system must adapt to deep, fast-paced technological advances and become more quality-oriented. Curriculums must change to reflect the key role of innovation, entrepreneurship and cultural exchanges with other regions of the world. Failure to modernize the education system in this regard is a surefire way to undo the progress of recent decades. Far-reaching technological changes, automatization and advances in robotics could have unsuspected consequences for the distribution of the wealth of future generations. There are still significant aspects of the labor market which need to be modernized. Women and young people suffer most from poverty, increasing overall inequality. It is vital to increase the female labor market participation rate, which is currently around 45%, 20 percentage points lower than it is for men, and to close the wage gap between men and women (currently around 30%). The labor market insertion of women would be boosted by increasing the number of day-care centers, nurseries and homes for elderly people, in order to loosen the binds which keep women at home. Focusing on improving job opportunities for women could generate a virtuous circle to tackle inequality and poverty, with greater household income leading to increased savings and improved health outcomes. The economy should expand only moderately this year due to continuing subdued consumer and business confidence. However, we do expect higher copper prices and a healthier regional scenario to support growth with looser monetary policy also lending support to ailing investment. 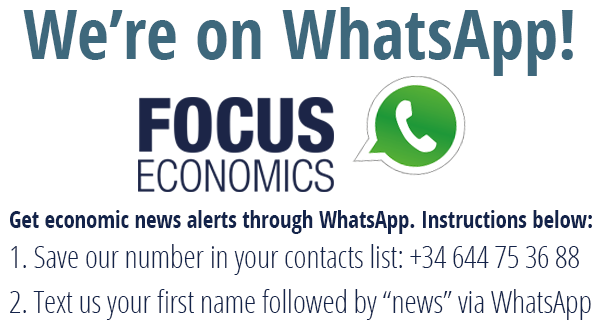 FocusEconomics Consensus Forecast panelists see Chile’s economy expanding 1.6% this year and 2.6% for 2018. If you'd like more Consensus Forecasts and written analysis from FocusEconomics, download a free sample of one of our FocusEconomics Consensus Forecast reports by clicking on the button below.